My husband and I are planning to do the St. Regis Ponds Loop in late July. We have done the 90 miler from Old Forge to Saranac Lake twice so portaging is not a problem for us. Our plan is put in at one of the Follensby Clear Pond accesses. Since we will be driving up from Virginia we will most likely need to find a quick campsite on Follensby or Upper Saranac Lake. We camped on Buck Island a few years ago and would love to stay there again but know that motor boaters can be an issue as they get there first. On our first full day, we plan to paddle north on Upper Saranac Lake, jump of Tommy's Rock if the weather is amicable, paddle up Hatchery Brook (anyone have any info on this?? ), carry into Little Clear Pond and then St. Regis Pond where we will camp for the night. On the Second day, we will be traveling through Ochre Pond (Is the water navigable this time of year to avoid the carry from St. Regis to Ochre? 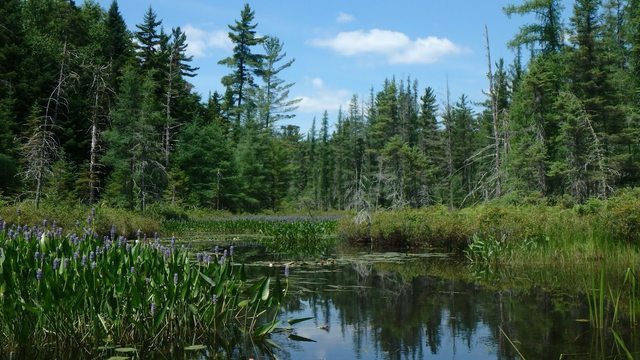 I have read that sometimes it is at high water), Fish Pond, Little Long Pond, Kit Fox Pond, Nellie Pone, and finally camping somewhere on Long Pond. I hear that carry is fun... not. What are the best sites on Long Pond? Finally on our last day we will finish the loop, Long Pond to Floodwood to Rollins to Whey to Fish Creek and back to the car on Follensby Clear Pond. I'd love to hear your advisee or suggestion on this route. If you know of any info or think we should do the route in reverse, please let me know why. Thanks in advance. Its been pretty dry as of late, I'd definitely check on the water levels in Hatchery Brook before committing to it. Macs Canoe Livery may have current information on it. The carry to Long Pond from the north is not terrible, just long. The worst part is getting up onto the esker from Fish or Little Long - its quite steep from either direction. Once you're up there, its fine, just lengthy. Towards the south end beaver pond flooding usually requires a short hop back into the boat across the bog and then back onto the portage trail for the final several hundred yard to Long. This is a perfect response. Hatchery brook may be a problem for you and the kick up at Fish is a PITA. I'd be inclined to try and reach Fish Pond rather than overnight at Ochre but that's a choice that comes with another carry at the end of the day. It's a fun route. Thanks for the responses! What if we dropped our boat and gear at Little Clear Pond, drove the car to the parking area on the northern shore of Upper Saranac Lake and walked back. This would still allow us to do the proposed loop but cuts out Hatchery Brook and the portage along Route 30. This will also allow us to camp on Fish Pond. My only concern is that everyone is recommending it, will it be packed? I'd love to hear any other thoughts or suggestions. This will also allow us to camp on Fish Pond. My only concern is that everyone is recommending it, will it be packed? In the summer just about anywhere in the park can get busy. But the more carries it takes to get somewhere the less likely the chances for crowds. The risk is that the sites are used by folks that are sitting tight, not passing through. From my experience on the 16 carries the sit and park crowd tends to get to St. Regis and lock down all the sites, then they get back to the other ponds as "day adventures"..the other thing to keep in mind, if wheels don't work, crowds fall off. If your heading in Monday through Friday getting a camp site should be no big problem, weekends ??? Hatchery brook is a beautiful paddle, small tight and very personal feeling. My brother and his wife visited from San Francisco area last summer and we did day trips every day, the Hatchery Brook paddle was their favorite by far. For so easily accessible a paddle it is little paddled. Your trip plan is one of the best paddles in the country in my (biased) opinion. I was on a part of your proposed route last week Mon + Tues and saw no one, I did though see Loons, Osprey, Eagles etc and very few of the smaller flying critters (black flies mosquitoes). My 2010 version of the Adirondack Paddler's Map doesn't show a portage between Clear and Little Clear. Maybe I need a new map. We tried to paddle from St. Regis to Ochre last summer and ended up taking out and carrying. Best sites on Long Pond are the ones that are on points of land. 10 has been moved slightly eastward. Number one on Slang has a nice boulder shore. Dropping the gear at Little Clear and parking at the Upper Saranac launch is interesting. Then you could go under the 30 at the southern end of Follensby Clear via Fish Creek Ponds, and then northwards on Upper Saranac to your car. Last edited by Titanium Spork; 08-16-2018 at 04:59 PM.. Reason: rm "I'd be surprised if Fish is packed." In retrospect, who knows? It doesn't have many sites.